If you are unfamiliar with the different DNA tests for genealogy and you would like to know what you are ordering, compare the features and prices of the major DNA testing companies. FREE Family Tree Builder - Free family tree software used by millions of people worldwide, Family Tree Builder helps you research your family history, build your family tree and add photos, historical records and more! FREE 14-Day Trial of the Complete Plan - everything MyHeritage has to offer! FREE UPLOADS Have you already tested your DNA at another company? Did you know that you can upload your DNA data to MyHeritage and receive DNA Matches for FREE? Project Discount: For Y-DNA tests (males only), join a FTDNA Project before ordering to save US$10 or US$20. Find a project matching your surname, or simply start your order by clicking on a reduced-priced kit from any project (eg. Australian Citizens). Learn more about FTDNA projects. (Note: project discounts apply during some sales, but not all). Free Y-DNA tests: Some surname projects offer free Y-DNA tests to encourage males with particular surnames to test - so check the ISOGG list of free DNA tests. Living DNA - National DNA Day Sale! Living DNA is highly recommended if you have British heritage... their 3-in-1 test includes a detailed breakdown of your biogeographical ancestry (into 80 worldwide regions including 21 British regions! ), as well as your motherline (mtDNA) and fatherline (Y-DNA, males only) haplogroups. As more regions are identified, your results will be automatically updated (Irish, German, Scottish and other regions are currently being developed and your results will reflect these as they are completed). Get your DNA into the database now, ready for Living DNA's exciting new Family Networks and relative matching features (currently in Beta)! FindMyPast DNA sells Living DNA kits. Their partnership means that in the future you will be able to link your FindMyPast family tree and records to your DNA profile! 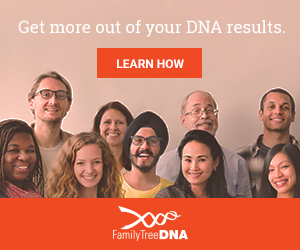 At FindMyPast, Y-DNA and mtDNA are optional: A$39.95 extra for the Deep Ancestry Upgrade. No FindMyPast sales just now, but bookmark this page and check back regularly! 23andMe rarely has sales for Australian customers, but if there is one I will list it here ASAP! I have been working on my genealogy for quite a while and have quite a bit now, BUT my dads mothers grandparents. I believe my great great grandmother was full Choctaw Indian. I am not sure that any of the DNA tests will help me since I am female and its on my (deceased) dads maternal line and there isn't any males alive that I know of. Any thoughts? Hi Paula, you don't need a male to test, as females receive admixture estimates from autosomal DNA tests too. And an autosomal DNA test will match you with other people who share DNA with you, so you may match some relatives from your Dad's maternal lines, which could be very helpful. Good luck!